It’s been quite some time since I’ve posted anything here. I’ve had a number of things on my plate, including my ongoing Masters Thesis project. Well, now it’s DONE, and you can read it here! It’s a real page-turner. I wrote my thesis on Cory Doctorow’s Recent novel, Makers. Originally, the idea was to write something that had a great deal to do with the aesthetics of practice that this blog has been dedicated to developing. In the end (as seems always to be the case) it ended up being about something rather different. ere is still a long-form piece in the works regarding Makers and the materiality of use-value. This paper is a descriptive bibliography, which seeks to elucidate the implications of Doctorow’s very forward-thinking publications practices for a twenty-first century theory of the novel and novel readership. Check it out by clicking the link below. The collapse of base into superstructure that Jameson posits in Postmodernism, or, The Cultural Logic of Late Capitalism seems to have broad and unsettling implications for the Marxist model itself. After all, if political-economy has aligned itself completely with cultural production, it must become increasingly difficult to argue the primacy of the former. It is surely by this line of reasoning that McLuhan can argue for a new technological primacy, and the post-structuralists can argue the same for language. Who is to say, in such a collapsed state, which is driving which? Tom Leddy, in his article ” “Everyday Surface Aesthetic Qualities: ‘Neat,’ ‘Messy,’ ‘Clean,’ ‘Dirty’” (Published in The Journal of Aesthetics and Art Criticism, 53 (3), 259-268), attempts to position everyday notions of organization and cleanliness within the discourse of aesthetic consideration. It is easy to see that, when we speak of ‘clean lines’ in a painting, we are being rather metaphorical in our use of the term, transferring a term from everyday situations in order to speak of aesthetic qualities. However, when we borrow such terms for new applications, we also inevitably borrow a larger part of the original concept, no matter how metaphorical we are intending to be. And as Leddy points out, there is no clear place to draw our distinction between what is a literal use of a word like ‘clean’ and what is finally metaphorical. The term ‘clean’ itself is always relative, so that its object inevitably falls onto a sliding scale of application. A clean room might be one in which all visible dirt has been removed and things have been put back in their right place. We would not be happy with this same definition applied to a fork in a restaurant. A clean fork is one that is thoroughly sanitized. So it could be said that the term ‘clean’ as applied to the room is far more metaphorical than the same term applied to a fork. Likewise, even our qualifications for the cleanliness of a fork may look rather metaphorical when compared to those we require of a syringe or scalpel. Leddy suggests that we call those qualities listed above, whether we are locating them in an artwork or a bedroom, “Everyday Surface Aesthetic Qualities,” and goes on to argue that, while we might like to draw a line between their use in aesthetics and everyday life, that line would inevitably be arbitrary and subject to continual debate: a certain ‘messiness’ injecting itself even into our definitions of ‘messy’. Furthermore, Leddy points out, “we learn the concept of cleanness [and other everyday surface aesthetic concepts] as children,” which “gives the perceptual meaning of ‘clean’ a certain developmental primacy” (261). This last point seems to suggest what we must assume is true: that aesthetic sensibilities are built up over time on top of those general sensibilities that we early develop regarding our immediate surroundings. Indeed, it seems as though Leddy’s list is rather too restrictive, as many of those terms which we associate with high-cultural aesthetic critique (even some of those which appear frequently in the aesthetic literature) are more or less metaphorical reapplications of terms used to describe everyday perception. For example, we might speak of a film or a piece of music being ‘light’ or ‘dark’, of a fine wine or cheese as being ‘chocolatey’, of a painting being ‘forceful’ or a poem’s rhythm as being ‘loose’. All of these words are taken from general descriptive use and reapplied as aesthetic categories. Perhaps aesthetic sensibility in general requires not so much the attainment of new critical categories but the transference of more generalized critical categories into the realm of high-culture critique. The layperson struggling to describe an aesthetic experience is not so much searching for the right word as searching for the correct metaphorical application of a more generalized descriptor. This also raises a question as to the ‘naturalness’ of such metaphorical applications. An aesthete would likely employ metaphorical aesthetic descriptor, such as ‘dynamic’ or ‘forceful’, and when pressed for the reasons behind such a usage point to certain similarities between the metaphorical application and the more literal one. But I wonder how naturally such metaphorical applications arise. Would a layperson, if pressed for a description of aesthetic qualities, arrive at similar terminology? Leddy grants his Everyday Surface Aesthetic Qualities rather little in the way of complexity, but allows that they assist in the appreciation of what he seems to see as the deeper aesthetic qualities of a work. An old oil painting, therefore, benefits from a literal cleaning in large part because that cleaning reveals and clarifies those more complex aesthetic qualities which are of most interest to an aesthetic evaluation of the work. I am not so ready to cede the complexity of everyday surface aesthetics. I am suspicious that when Leddy classifies such qualities as lacking in complexity, he is taking for granted the socially constructed field of high-culture aesthetic qualifications which his study seems at first interested in calling into question. Leddy gives the lie to his assumptions when he asserts that “[i]t is because of this complexity that we have professional critics in art and not in room neatness” (263). Bourdieu suggests that aesthetic complexity itself is socially constructed, so that calling any one aesthetic quality ‘complex’ and another ‘simple’ or ‘straightforward’ is as much (or more) an assertion of one’s cultural capital as it is a statement of any phenomenon inherent to the object itself. If anything, that such aesthetic qualities as Leddy is interested in exploring are so ingrained into our everyday consciousness as to seem straightforward or easily taken for granted suggests a deeper social significance. Leddy touches on this possibility when he suggests that, as we early learn concepts of everyday surface aesthetics, that education “seems to privilege ‘neat’ and ‘clean’ over ‘messy’ and ‘dirty’” (261). He goes on to point out that a sensibility which values a certain degree of messiness or disorder is often associated with avant-garde artistic movements, such as Impressionism or Abstract Expressionism, part of the attraction of which “may be due to this tension between surface messiness and underlying neatness” (260). To what degree might this type of resistance be seen as ideological opposition to an aesthetic power-block which values cleanliness and order? Walter Benjamin, discussing the aesthetic sensibility of Germany under National Socialism, warns against a “concept of beauty” which shows “the same devotion to the licked-clean which the carnivore displays toward its prey” (“Review of Sternberger’s Panorama”, in The Work of Art in the Age of Technological Reproducibility and Other Writings on Media, Cambridge: Harvard UP, 2008, p. 160). It seems as though a whole range of artists are interested in subverting the cleanliness of their aesthetic objects. Modernist and postmodernist novels calls into question notions of ‘clean’ narrative voice and character development; avant-garde music subverts the notion of ‘clean’ melody; jazz and rock and roll music undermines notions of ‘clean’ instrumentation. The resistance to such notions of ‘cleanliness’ and ‘order’ in artistic fields is enough to call into question the ideological ground for considering ‘cleanliness’ as superior to ‘messiness’. Kant’s “free play” of cognition (421) marks the outer bound of his liberal human. The free-play of cognition acts as a black box beyond the bounds of which we have no conscious access. For Kant, the best that this subject can do is express the effect through abstraction, by calling beautiful that thing which inspires the impression. Later, Freud uses the abstraction of the dream to attempt the same, and Saussure and Lacan and Derrida read this absence in language. The French theorists are also Kantian insofar as they grant our inaccess to the thing-in-itself, the signified. In Lacan, we reach the mirror stage quite early, well before we are able to make a choice in the matter, and the transformation is part of a one way process. Once we are embedded in language, we cannot become unstuck. Derrida uses Kant’s pererga to explain away the object d’art. They both seem to accept, as Kant, that there is a clearly-demarcated and unbridgeable gap between an “I” and an “it.” Further, their theory of language cuts us off from both. The subject remains for Lacan, but it has now become alienated from the object as well as itself. Nietzsche is a great antidote to such positions, which is I guess ironic since he must also have been foundational in the work of the French theorists. He posits the dissolution of the unified subject, our immersion in the world of the thing. The emperor, he suggests in “On Truth and Lying,” has always been naked, and it is only through language (broadly construed—Nietzsche speaks in terms of metaphor) that we have found ourselves stuck in the first place. Nietzsche distinguishes between the man of concepts, regularity and reason, and the man of pretense, myth and immediacy. Modern, enlightened man, he says, will “no longer tolerate being swept away by sudden impressions and sensuous perceptions,” but must rather “generalize all these impressions first, turning them into cooler, less colorful concepts in order to harness the vehicle” of his life to them (768). Nietzsche offers a radical and unsettling world in which this unsticking might be possible. He turns to pre-Socratic Greek society for an example of man for whom, “thanks to the constantly effective miracle assumed by myth…anything is possible at any time, as it is in a dream, and the whole of nature cavorts around men as if it were just a masquerade of the gods” (772). Modern man rarely considers just how much of his life and society functions based on the assumptions that trees will not talk and things, when dropped, will fall to the ground. By calling to mind a people for whom these assumptions did not hold, for whom at best trees usually didn’t talk, Nietzsche challenges us not to start looking for talking trees, but to recognize our position within the construct so that we might realize our own embeddedness in Nature (and thus, perhaps, gain perspective on ourselves as a species). He reminds us of what the physicist or the brain-scientist might remind us: our minds work the same way as everything else, and are made up of everything that is the world. Any distinction between ourselves and our environment is possible only by the workings of the very universe we hope to examine. But we might instead look outward, and begin to see ourselves finally as a part of the integrated circuit, to discover ourselves as acting agents in the physical world. We can recognize ourselves as things in motion in a universe of things in motion, and might find a new center (or perhaps sidestep the need for one) in an understanding of how our actions work to change the physical world, and how we are acted upon by that world. Rather than dissolving the subject, we might better dissolve the object. We might interpret the object world as it works to extend our inner world into space and time. This is an exercise in consciousness, but it is also a material process that must consider the human in the most physical terms. It is one best begun by extending the physical parameters by which we define the human body. Let the psychology present itself as an effect (a physical effect, no doubt) of the material processes, the things in motion. By doing such a biography, Kopytoff argues, we might illuminate the ways in which things are not only materially constructed, but socially and culturally constructed as well. We could examine the life of a car, as it goes from gleaming newness to well-used shabbiness, to dilapidation, and (if it is lucky) to a second life as a restored classic. Notice that, by calling the well-loved classic lucky, I am already talking about the thing as if it were in some ways human. Indeed, with the example of a classic car, the real felt and often admitted emotional and psychological attachment is quite common. We might be less inclined to consider the biography of a paper clip, or of a dollar bill, or of a blender. Last night I happened to watch the documentary Tapped (2009, Dir. Stephanie Soechtig, Jason Lindsey) on Netflix. It is essentially a (quite lucid) examination and condemnation of the bottled water industry. I admit that the most compelling sequences were those which exposed the unjust and heavy-handed tactics of the large water-bottling corporations (Nestle, Coke, and Pepsi, in case you don’t know). However, the film also contained the obligatory discussion of the way that plastic water bottles originate in oil and become waste. The life story of a bottle. These sorts of ecological project, those that take on litter or resource depletion, are always faced, it seems to me, with the task of waking up their audiences to the thingness of their things. And how often biography seems an appropriate rhetorical mode. Tapped, however, seems to fail in their bottle biography at at least one (crucial) moment in the bottle’s life: the time it spends actually interacting with humans. The analysis of the bottle-making process is well-developed, and accompanied by footage of the bottle factory. Likewise, the end result of bottle profusion is demonstrated through an interview with an ecologist, a walk along a well-littered beach, and a trip out into the North Pacific gyre. The moments in between however, what might be called the bottle’s “best years,” are captured only in a hazy segment shot from a low angle in which anonymous masses walk down the street carrying their water bottles absentmindedly in hand. This seems to fall short of the purpose, if only because it is just this absentmindedness with regards to the thing of the bottle that the documentarians have an interest in shaking up. In a similar sense, Bruno Latour introduces a sociology of things. He speaks of things as “nonhumans” in order to emphasize their ongoing relationship with what is designated (often without examination of the term) as “human” (XC 298). The things he is most interested in examining are those things to which we have “delegated” some otherwise more difficult human actions or responsibilities (XC 299). I might call his things technology, but technology broadly construed. Latour’s illustrates his concepts (often quite humorously) through the example of a hydraulic groom or automatic door closer. Through the introduction of a door (which replaces the human necessity of smashing down a wall and then rebuilding it each time we wish to enter or leave a building), a spring (which eliminates the need of a human groom or door-man, as well as the hassle of constantly training the general public to close the door behind them), and a hydraulic pump (which, by storing up real human energy, eliminates the possibility of being injured or distressed by a too-quickly swinging door), the door-closer integrates itself very particularly into a real human social context. It does human work, and it even has certain limitations which impose actions back onto human actors (the need to keep the door open, for example) which Latour calls “prescription” (XC 301). Latour suggests that if we want to know just how much work we have delegated to a particular thing, we must only imagine the world without it. He insists that a study of society which does not include the things to which we have delegated human responsibilities would ever be incomplete and ultimately misleading. A study of the ‘flash mob’ phenomenon or the student protests of Iran’s Green Revolution, for example, would seem ridiculous if it neglected to include the complex role that social media played in their organization and outcomes. Likewise, a study of family eating habits must incorporate an interest in the cookery, the ingredients, and the table. A genealogy of things might prove equally fruitful. We might examine the heritage of a thing, those things which came before it and might be said to have ‘led to’ the particular thing we are interested in investigating. The ancestors of a thing might find their kinship in a physical relationship, a relationship of specific purpose, or an aesthetic heritage. In any case, tracing such relationships between things might illuminate the various paths by which our ideas about things, their specific cultural meanings, transform over time. 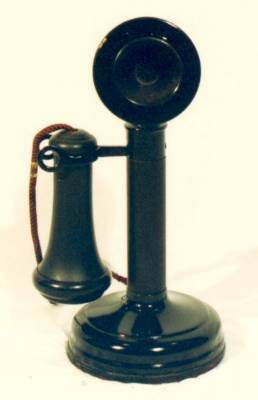 The early telephone had a separate apparatus for speaking and for listening. It was an expensive technology; people usually had only one phone in their house, and this often in the main hall. In order to call someone, you had to ring through the operator. Thus, it is safe to say that the early telephone was not an exceedingly personal device. One might not count on a telephone conversation being private, when anyone in the house might hear, to say nothing of a potentially nosy operator. But we can see that a great deal of labor has already been designated to the telephone. It is no longer necessary to walk across town to speak to a friend, or to post a telegram or a letter (which themselves require labor in their delivery). 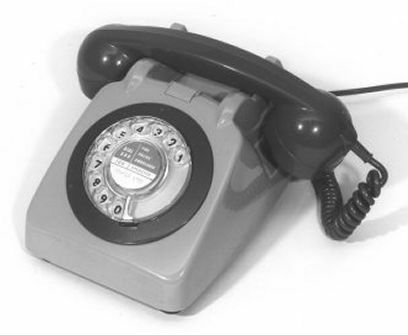 As telephone technology advanced, the direct-dial was added and the ea r and mouth pieces were incorporated into a single handset. This is an improvement in efficiency, for sure. We can now leave the heavy part of the phone on the table, and lift only the lightweight handset. We have also designated to the telephone system the responsibilities once held by the operator. It is important to note, after Latour, that the operator’s role has not disappeared; it is simply that it is now performed by a thing. 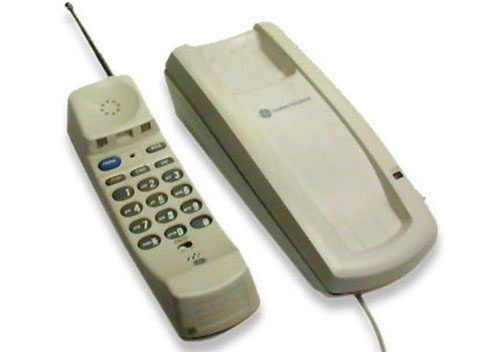 But the direct-dial also offers the possibility that the telephone might become more discreet. We can make a call, say, to an accomplice or a lover, and we might expect a certain degree of privacy on the line as we cradle the handset on our shoulder and speak softly into the mouthpiece. Note that word: cradle. This is what we do with that handset, isn’t it? And even when we set it again on the base, it is still cradled. The aesthetic transformation of the phone, therefore, seems to mirror (to imply, to demand) a changing emotional relationship to it. The earliest phone, likely in the parlor, looks quite a bit like a mash-up between a coat rack and a loud-speaker, a public depository with a public voice. The later phone is more intimate. We cradle it, we finger the dial, we twirl the coiled rubber cord. When the phone goes cordless, it seems to imply a certain new freedom. We are no longer tied to the wall or desk on which it sits, we are free to roam the room. But the cordless phone seems to prescribe some new action on our part as well. For if the phone can be where ever we are, then there is no excuse for missing a call. We are always connected. Though we can take the phone into the closet to speak in private, we have given over to the technology the possibility that we are ever, in fact, alone. This last piece is carried through to the cell phone as well. Kottke brought this article to my attention, all about the corridor in science-fiction film. The designs that Roger Christian synthesised from Ron Cobb’s prolific and extraordinary conceptual sketches for Alien (1979) are lingered over lovingly at the start of the movie. Ridley Scott knows that corridors matter in a horror (or ‘haunted house’) movie, but these marvellous sets are also being showcased to sell the gritty and grimy, commercial and industrial reality of the Nostromo as well. The upper sections related to the command deck were dirtied down with gold and black paint after a reshuffle of sections in order to convey the grittier world inhabited and Parker and Brett on the engineering level. Anderson mentions films with a lot of ‘corridor business’.